I just completed the demo. - You get quite a bit of gameplay in the demo: 3-4 single player missions, about 45min worth of play time. - graphics are good but didn't really blow me away. I guess I expected more detailed ground elements (villages, city buildings, ships, etc). For some reason the game didn't look quite as good in motion as it did in screenshots. - target boxes are pretty tiny. So is your crosshair. I found my self squinting a lot trying to line up targets. - damage/fire/smoke effects are excellent. As you get shot up you start catching on fire which makes it a bit hard to see things. - very arcadey/simplified control system. You can't roll independent of turning. You can do loops and even stall. 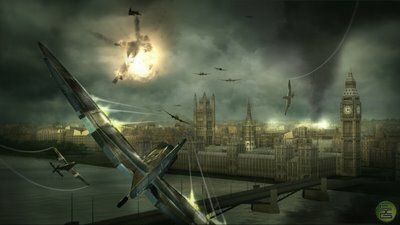 Those of you that like the advance control settings of ace combat might be a bit disappointed. - The lock on camera view takes a bit getting use to but after you get use to it, it works pretty well. Still I wish there were more hud elements even though it's 3rd person. Maybe a few carrots around the edge of the screen would have helped tracking enemy planes to supplement the lock on camera. - missions are pretty long with multiple objectives and an in mission check point save system. Any damage sustained is persisted between checkpoint restarts. - Annoying invisible walls. You'll be lining up a shot then all of a sudden it goes letterbox and turns your plane around for you. - gameplay is still pretty fun and exciting for the most part. Hmmm I was pretty excited about this title and was planing to pick it up. Now I'm not so sure unless there is a really good sale. Maybe multiplayer will be better. I have to say I was expecting more and came up a bit disappointed.